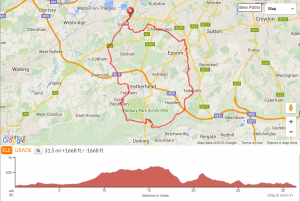 A nice 30 mile route going down Box Hill Zig-Zag for a change. Heading out via Ewell and Tadworth and continue climbing gently to Box Hill. A quick coffee and cake and head home via the Chappel Lane/Blagden Hill climb. Descend to Fetcham and a few small bumps back to HQ.